Opening a Holy Door has long been part of jubilee ceremonies. None was more moving than Christmas Eve 1999, when an ailing Pope John Paul II, bent in his infirmity, knelt on the threshold of St. Peter’s Basilica Holy Door at the Vatican. Holy doors, which are sealed after the jubilee, are opened only once every 25 years. Notre-Dame becomes the seventh Holy Door in the Catholic world — four are in Rome, one in Ars-sur-Formans, France, the other in Santiago de Compostela in Spain. “With the Holy Door, we invite people to come to Quebec with their own faith, with what they live, as a heritage from the missionaries of the 17th century,” says Monsignor Denis Belanger, the priest at Notre Dame. 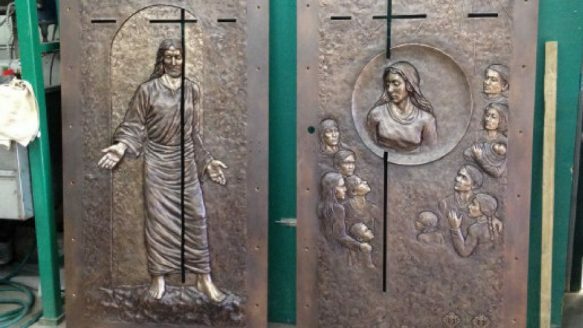 The door — two-sided bronze, with Christ on one side, Mary on the other — will be opened for one year and then locked until the next time the Holy Doors in Rome are opened, in 2025. The door is on the left side of the cathedral. Workers broke open a wall to create the door, which now leads from a garden into what was a small chapel. The chapel gives way to the cathedral proper. Even if religion is not a part of everyday life for most Quebecers, “the background of this modern, secular society is, of course, Catholic,” says Susan Sebert, a former adult educator and now tour guide in Quebec City. Families with three children were not considered large enough, and women were encouraged to have many more, Sebert says. Many left the church. “They really are being inclusive,” says Sebert. In this way, she says, the church is talking to a generation of people in Quebec who have turned away. The opening procession through the door will also include relics of Canadian saints and those who have been designated “Blessed” by the Catholic Church, but not named as saints. The relics will remain in the church throughout the year. Jesous Ahatonhia (Jesus is Born), composed by missionary Jean de Brébeuf in the Huron language in 1643, is the oldest Canadian Christmas carol. Marie de l’Incarnation was an Ursuline nun who started learning native languages after her arrival in 1639. She wrote a French-Algonquin dictionary and an Iroquois dictionary and published a catechism in Iroquois. She saw that native girls had difficulty studying in a classroom, so she held classes outdoors in the monastery garden, to provide a more comfortable learning environment. While Notre-Dame celebrates the 350th anniversary of the first parish, the first formal church organizational structure, in the New World, there were earlier churches. Christopher Columbus laid the first cornerstone in the cathedral of Santo Domingo, now the capital of Dominican Republic, in 1514.